London Fashion Week has again swept out of town for 2017, leaving behind nostalgia, pops of colour and collections styled around the Britain of the past. London-based designers like Mary Katrantzou sent clothes down the catwalk that looked back to childhood pastimes. That’s prints reminiscent of Lego bricks, fabrics that suggest paint by numbers and arms full of friendship bracelets. Britain’s fashion powerhouse, Topshop, didn’t disappoint with a show soaked in vintage-look fur coats, slightly sci-fi silver trousers and silky tracksuit tops for a luxe feel at an affordable price. Looking at the social media data, this was the most talked-about show of the week. Other British talent on show included Christopher Kane’s floral and sheer pieces that used bold colours in reds, pinks and yellows while playing with references to 1940s’ housecoats and a new silhouette. The names on many people’s lips were London’s bright you things, Michael Halpern, Matty Bovan, and Marta Jakubowski who pushed the envelope with stylish sequined efforts from Halpern and sleek and beautifully placed ruffles and leotards from Jakubowski. London Fashion Week is not the only place to see UK suppliers and companies making an impact on high fashion. 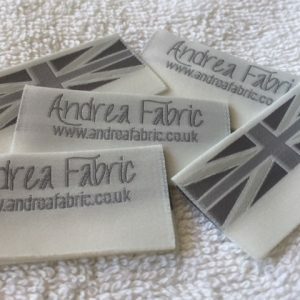 We’re proud to supply woven labels, clothing labels and fabric labels to a range of experienced and high-quality designers that set their work apart from the crowd. If your brand needs woven labels with UK design, high-quality and great service then get in touch to see how we can collaborate. 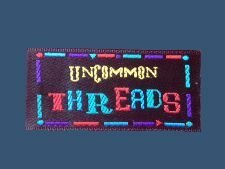 We offer a professional and quality made woven clothing labels. Visit our website home page for more options of clothing labels, click here. Our woven damask labels are the most popular woven labels suitable for any designer clothing brands. We offer woven labels short run production, no minimum requirement and free UK delivery. Contact us today, our contact details are here.